When the Seattle Symphony set about modernizing its community and education wing at its home in Benaroya Hall, it decided to create a space that brings new technology and design together with creative and innovative programming, including a renewed commitment to new music and new artists. The result is Octave 9: Raisbeck Music Center, which is scheduled to open in March, and this Saturday (1/5 at 7 pm), A Tempo provides a taste of what's to come in the first season. Host Rachel Katz will speak with Symphony President and CEO Krishna Thiagarajan, Vice President of Artistic Planning and Creative Projects Elena Dubinets, and Composer in Residence Derek Bermel about the opening events, how the technology and design will enhance the performances, and how such forward-looking programming fits into the symphony's mission and vision for the future. 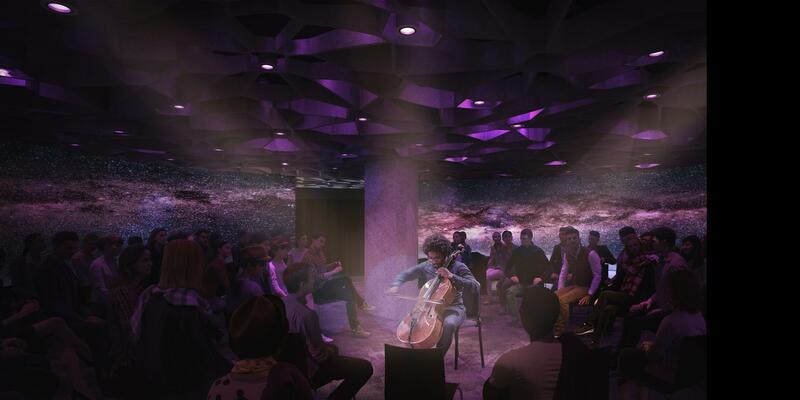 Architectural rendering of some of the possible performance set-ups at Seattle Symphony's new Octave 9: Raisbeck Music Center venue.